« Day 248: Oh! Jakarta! For us in Europe when you speak of Indonesia most people think of aromatic coffee, the resort island of Bali, and the loudest ‘bang’ in the history of the mankind – Krakatau. It had been a childhood dream of Nic’s to one day visit world’s most famous volcano – ever since seeing the disaster movie ‘Krakatau, East of Java’ – though the makers were obviously too busy to consult a map whilst filming as it is in fact just off the West coast of Java! Visible and visitable from Carita beach on West Java, Krakatau was the epicentre of the 1883 explosion whose force was equivalent to 10,000 Hiroshima atom bombs. The force of the eruption blew the volcanic island apart. The air pressure waves stopped clocks and smashed windows in Jakarta, 250km away, and was heard as far away as London and Alaska. However most of the damage and deaths in the region were caused by the colossal tsunamis that followed – one single wave as tall as a seven storey building raced outwards to the coasts of Java and Sumatra, demolishing everything in its wake. Three hundred towns and villages were simply erased, and over 36,000 people killed. For two years after the eruption, ash blown up into the atmosphere lowered global temperatures and caused psychedelic sunsets all over the world. 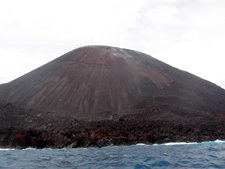 30 years after the eruption a new volcano (Anak Krakatau – child of Krakatau) rose out of the sea on the spot, and is still active (and growing) today. Considering it is one of the major attractions of Indonesia, getting there from Jakarta was surprisingly difficult. All inclusive tours were prohibitively expensive (upwards of $200 each). Getting there by public transport is dramatically cheaper – though a health hazard due to the chain smoking locals on the bus – and also there is no guarantee that a cost-effective boat trip will be available once you get there. We decided to chance it. The journey was very painful – thick pungent cigarette smoke, no air condition, cramped seating (worse than budget airlines), and the interminable stoppages as the driver pimped for more passengers along the way. The roads were terrible, and every stop would bring on-board numerous hawkers selling drinks, food, and more cigarettes. What should have taken 2 hours by car actually took us 5 hours!! We had expected Carita to be a lively bustling resort town – particularly since it was a public holiday weekend. Sure enough there were plenty of hotels along the beach – but almost no-one around as the day drew to a close. 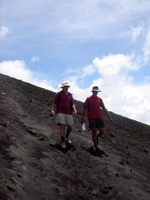 We found a hotel, than went in search of a boat tour to Krakatau the next morning. 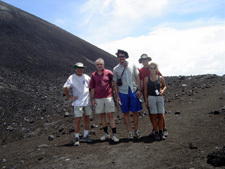 Fortunately the volcano god smiled on us – there was one company running a boat the next day, and there was another tourist in town (a Canadian called Erwin) who had been waiting for others to share the boat cost with! At $70 each it was still quite expensive for us, but we decided to do it. The next morning just as we were about to board the boat, two more Canadians (Ian and Michael) joined our group, thus lowering the cost per person to a much more affordable $50 each. We counted ourselves very lucky – having heard about two tourists who waited for 5 days to share the cost of the boat, and finally gave up and went home. 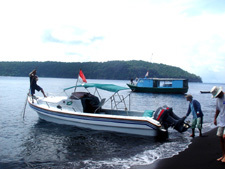 The boat ride to the island of Krakatau took 4 hours – the sea was choppy, with rain clouds in the distance. 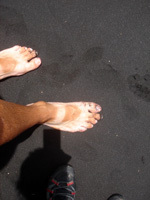 We landed on an amazing black sand beach by the volcano – it was really black like powdered charcoal! From the beach it was a short hike up to the shoulder of a hill next to the volcano. 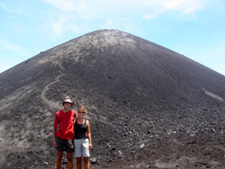 Although it wasn’t smoking the day we got there, the volcano showed signs of activity and the rangers did not allow us to climb to the top There were amazing views of the sea and nearby islands, and a wind strong enough to almost lift Sedef off her feet! After the volcano we were taken to another nearby beach for lunch and swimming, then around the island to a nearby reef for snorkelling. The boat moored right above the reef, at about 15m depth, with the reef wall plunging into the depths of the ocean on one side. Nic was nervous at the prospect of swimming in such deep waters, but he wanted to give snorkelling a go. So he showed amazing bravery and resilience, and after holding on to the boat’s ladder for 15 minutes, finally let go – to paddle around in his life jacket! :p The coral was quite extensive, with both soft and hard corals, shoals of tropical fish, and anemones and clownfish (like Nemo). The amazing underwater sight took Nic’s mind off his nervousness and together we enjoyed the underwater scenery. The weather started to take a turn for the worse and on the way back the waves grew larger and it started to rain. Thankfully our experienced captain managed to bring us back onshore in one piece.